A number is called self-describing if it has an even number of digits, so that the digits can be divided into adjacent pairs and pair truthfully declares that the number contains copies of digit . 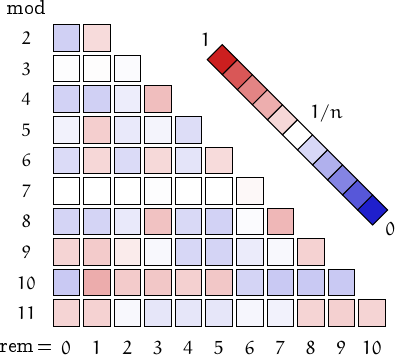 All digits must be accounted for, but pairs can be repeated. For example, the number is divided into the pairs , , , , this say: the number contains three , one , one and three . Another example, the number , divided into , , tells us (twice) that it contains four . The self-describing numbers are not very common. Up to (actually up to , since they must have an even number of digits) there are 783343 such numbers. The smallest pandigital one is 10141516181923273271. 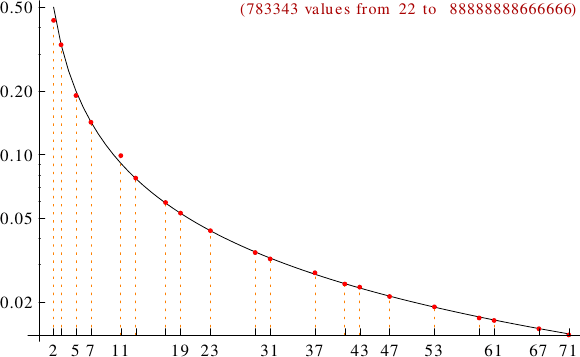 A graph displaying how many self-describing numbers are multiples of the primes p from 2 to 71. In black the ideal line 1/p.